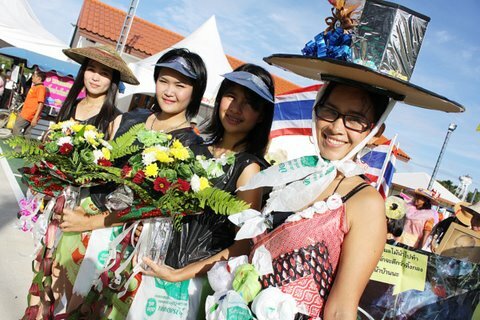 PHUKET: For its organisers, the waste management campaign march at Srisoontorn village in Moo 8 in Thalang district last weekend was a small step towards better local environmental awareness. They hope that more Phuket villages will follow in their green footsteps. The awareness campaign was inspired by the daily routine of villager Wiroj Kerdpon, who usually collects garbage as he does his daily exercise walks. Inspired by his example, the local residential committee decided to run a village-wide waste management campaign as part of its sustainable village project. In the new campaign, residents were shown how to separate their daily waste. They also learned how to use organic waste to produce Effective Microorganisms (EM) balls, which help to chemically balance and improve the soil in an organic way. Most of the villagers earn their living from agriculture. The village committee plans to establish a recycling market for villagers to exchange or trade in refuse. “Getting full cooperation from every villager will take time,” said Mr Wiroj. “Lack of cooperation is a barrier in this awareness education campaign.” Some villagers now collect rubbish around their homes but not yet in public areas. To encourage greater participation, last Sunday (January 16) the committee marched around in a colourful waste-collecting parade, joined by many villagers, some dressed in bits of refuse. Children were also encouraged to join, in order to raise aware of what they need to do to achieve a cleaner future. “Our campaign must be on-going,” said Mr Wiroj, who believed that with a continuing campaign, more villagers would realise the importance of waste management.